You probably don’t spend too much time thinking about your sump pump, but this inconspicuous home feature can have a big effect on the level of radon in your house. So, what do radon and your sump have to do with each other? Radon develops in the soil below your home, and it can enter the house through the foundation. Under most concrete basement or crawlspace floors is a layer of gravel. This gravel helps water find its way through the gravel gaps over to the sump pit where it is pumped to outside. Radon coming up through the soil can also travel over to the sump pit, where it exists into the air above the pit and into the room. Once radon gas is in the air, you can breathe in its radioactive particles. While limited exposure to radon is unlikely to have a major impact, long-term exposure can dramatically increase your risk of getting lung cancer. However, it’s not all bad news. It’s relatively easy to install a radon mitigation system, which will suction radon gas from the soil below your foundation before it ever reaches the sump pump pit and the air in your home. Will a Sealed Sump Pump Stop Radon from Getting In? When thinking about radon mitigation tactics, your first idea might be to cover your sump pump. A sump pump cover may help to slightly reduce radon levels because it will block a major opening from the ground to your basement. However, covering your sump isn’t enough, especially if radon levels in your basement are high (at or above 4.0 pCi/L). The sump pump is not the only point of entry for radon gas. Radon can also get in through cracks in the foundation, construction joints, and gaps in pipes. Most importantly, is you plug all the “leaks” in your floor, the soil gas pressure builds and the radon can go right THROUGH THE CONCRETE FLOOR!. Trying to stop radon by covering the sump pump is like applying a Band-Aid to a broken arm: it won’t solve the underlying problem. 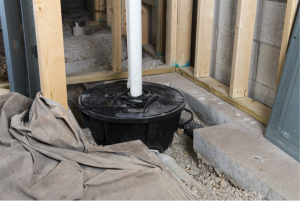 How Does a Sump Cover Fit into a Radon Mitigation System? While a sump cover on its own isn’t enough to stop radon gas from entering your basement, it can be part of a successful radon mitigation system. The most efficient and economical type of radon mitigation system relies on a process called sub-slab depressurization. The system includes one or more suction points in the ground below the home and uses PVC pipes and specialized fans to pull radon gas from the soil to a discharge point above the roofline. This prevents the radon gas from being released into the home, where you and your family would breathe it in. For a sub-slab depressurization system to be fully effective, all sizable openings in the floor (including the sump pit), must be sealed. This ensures adequate suction, so that radon gas gets pulled through the pipe instead of escaping into the house. When you work with DuPage Radon Contractors, our team will cover your sump pump and fill in any other basement floor openings as part of our radon removal system installation. While that might sound like a labor-intensive process, we’re usually able to complete the installation in just one day. And just 24 hours after installation, you’ll be able to retest your radon levels. If your levels aren’t below 4.0 pCi/L, we’ll adjust the system for free. Call 630-352-4846 or fill out our consultation form to get started.